Last year I ended up with 68,977 status miles, comfortable qualifying for United Gold but 6,000 miles short of Platinum. US$1449 for upgrading from Gold to Platinum due to 6,000 missing miles is pretty expensive. It would have been much cheaper buying elite miles through the status accelerator option when having an active United ticket. UA also doesn’t offer a soft landing from Platinum to Gold in case you can’t requalify like some airlines do it in which case I might have considered upgrading. As I don’t live in North America and rarely fly domestic the benefits of Platinum vis a vis Gold are immaterial to me. Gold status is good enough for my purposes of basic Star Alliance Gold benefits on partner airlines. Last year we also wrote about this promotion and a reader forwarded us his offer to buy back Gold for $1,549 so it’s pretty much in line with the pricing this year (though he missed by almost 17,000 miles). Is this an offer worth thinking about? I’d say that really depends. It’s really hard to earn Star Alliance Gold Status these days with a decent program, especially one where you don’t have to fly on their own metal due to the limited network that airline uses (Aegean comes to mind). While $1,500 is a good chunk of money I dare to say that in the past I found myself more than once in the situation of doing expensive mileage runs that cost a lot of time just to hold a status level. 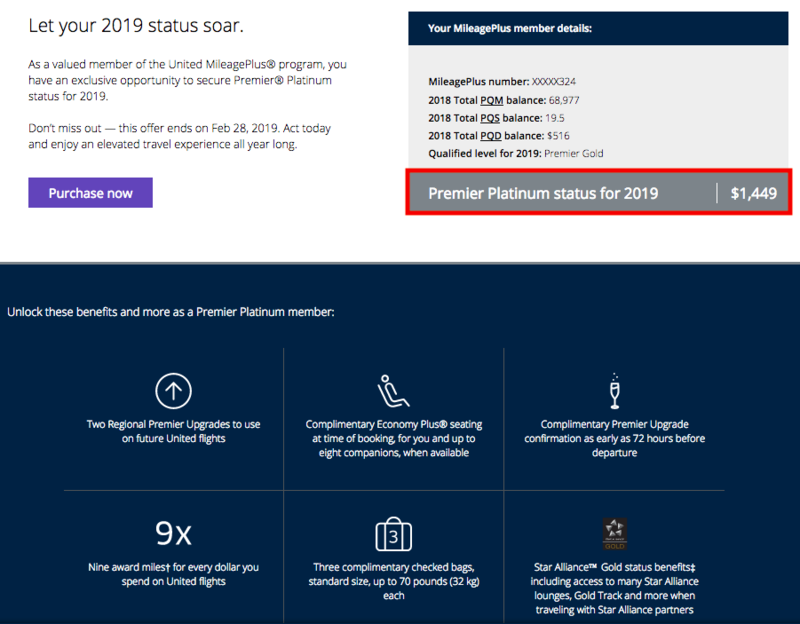 In the end it comes down to how much you expect to profit from Star Alliance Gold and the United Premier benefits during the coming membership year. If your travel is exclusively outside the U.S. without any domestic flight then things like unlimited domestic upgrades aren’t even part of that consideration. In case you travel a lot on domestic routes then however it might be a good investment indeed. UDU eligible routes matter a lot, especially on those where Gold members have a good shot at upgrades (I’ve received Premier Gold UDU upgrades on every single flight to/from Vancouver in the last two years). 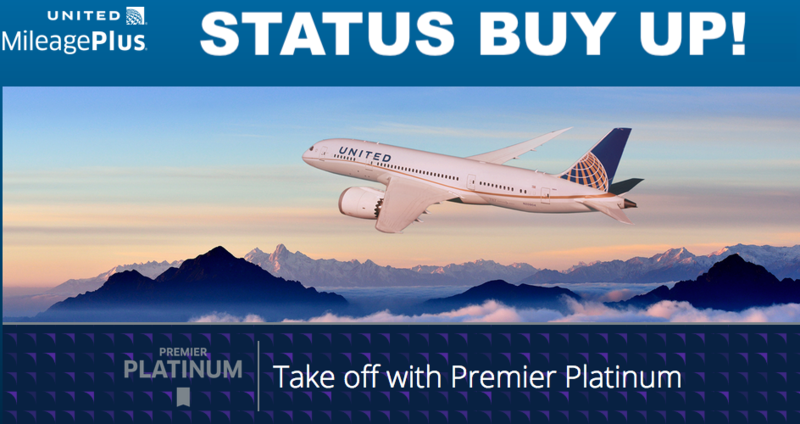 An upgrade to PLatinum would further your upgrade chances and it also includes 2 confirmed Regional Upgrades to apply to United Flights in North America. Those are valuable! These buy back offers are now a common phenomenon among loyalty programs of all kind and it’s sometimes not easy to determine if such an offer is worth it. Star Alliance Gold has plenty of benefits associated with it but how many of them are actually applicable depends on someones travel patterns. Ultimately it’s also about the bottom line: Can you afford it without hesitation? Prices for airline tickets are pretty low these days which means for that money you can buy a few tickets already, maybe even in Business Class with a bit of flexibility. Right off the bat I’d say if you can easily afford it then why not, the price is ok. If it’s ‘a lot’ of money to you then no, I’d not spend that much if I had to look after my finances more carefully. Have you received this email offer from United as well? Post yours below!